Prime Minister Nguyen Tan Dung has advised the central province of Nghe An to fully tap into its advantages of land, human resources, ports and airports to reach an annual GDP growth rate of 10 percent in the next five years. 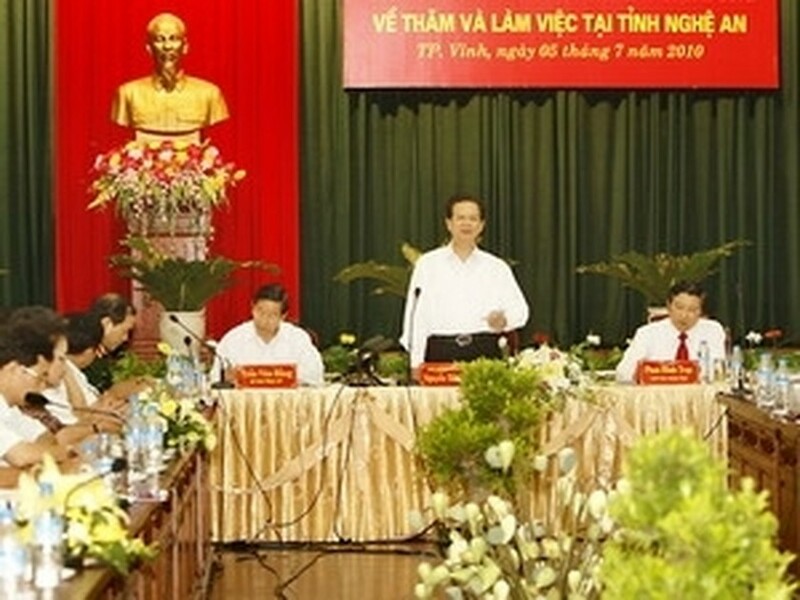 The PM met with Nghe An’s authorities on July 5 during his tour of the northern part of the central region about its socio-economic development plans for 2010 and for the next five years. The PM said that in the next five-year period, Nghe An should priorities planting industrial crops and breeding dairy cattle in 11 of its western districts where the land is fertile but up to 35 percent of the local people are poor. He asked the province to reclaim land from its forests and grow industrial crops, such as rubber trees and sugarcane, breed cattle and to use scientific and technological advances to make the best use of its land. Over the past five years, Nghe An has carried out various projects to encourage cattle breeding and produce top quality agricultural products. It has also built a steel mill and several cement plants that helped it to post a GDP growth rate of over 7 percent and reduce the number of poor households to just 14.7 percent. However, the PM asked the province to address social problems as soon as possible, including environmental pollution, drug addiction and poor management of mining activities while continuing to focus on training its workforce. At present, the provincial authorities need to take drastic measures to minimize the damage caused by droughts, disburse investments more effectively and manage prices to bring the number of poor households down to below 12 percent, said PM Dung. 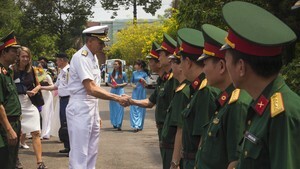 In Nghe An, PM Dung offered incense to President Ho Chi Minh at his commemorative house at the Kim Lien historical site. Earlier, the PM visited the Military Zone IV and asked it to strengthen ties with Nghe An to help it on a wide range of issues, including maintaining political security and improving the local people’s living conditions.